The recent spate of lewd online videos, where Chinese communist officials have been caught on camera in varying states of undress with young mistresses, has propelled one small bureaucracy to action. 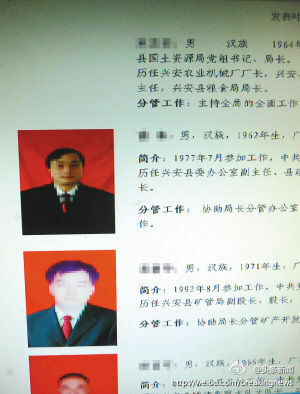 Cadres in the Land and Resources Bureau of Xing’an county, Guangxi Province, recently altered their official online portrait photographs, blurring their faces (or even removing them in some cases). Two explanations were given for this unusual measure, depending on who you asked. The officials said it was to prevent mischief-making online—such as their photographs being Photoshopped onto someone else’s body, and the evidence then used for blackmail. Netizens, on the other hand, said the move was a bid to prevent the officials being identified in case one of their own indecent videos turned up online. The department’s website was missing photos of its secretary and deputy secretary, while the photographs of other Party members had been pixelated, according to a Dec. 19 report by the local paper Guangxi News. “When the Xing’an County Land Resources Bureau released a photo of its leadership, some faces were blurry, like a mosaic,” Mr. Jiang, an insider, told the Guangxi News. He thought it was strange when he checked the official website, so he reported it to the paper, and the reporter confirmed it to be true. Departmental officials, Mr. Tang and Mr. Xie, told the paper that they and many other members of upper management at the bureau had received blackmail letters. The men alleged that rather blurry photos were included that always showed a man and woman in bed, but the head shots were very clear and matched the photos previously published on the website. So the photos were subject to a “mosaic” process, the officials explained to Guangxi News. No evidence was supplied that the photographs had been used in an attempt to blackmail the men, and by the following day the photographs were back online, as clear as day. On its Weibo, People’s Daily posted a screenshot showing the photos before and after they were updated following the apology. The game wasn’t over, though. On Dec. 22 when The Epoch Times checked the website, the photos were found to be extremely small, much smaller than the originals. The incident attracted online attention, and a post on Sina Weibo had received more than 13,000 reposts and comments by Dec. 21. “The leaders were forced to feel ashamed in the public eye,” said Pan Shiyi, President of SOHO China, a major real estate development company.